Yelp unveiled their annual list of the top 100 places to eat in the U.S. and a local Chicago eatery made the cut. Pi-Hi Cafe on the city’s North Side made the list at no. 100 on Yelp’s top spots to grub based on the most popular and well-reviewed places of 2014. Last year’s list – based on a decade’s worth of reviews – included Chicago’s upscale and world-renowned Alinea and the now-closed fast service favorite Hot Doug’s. 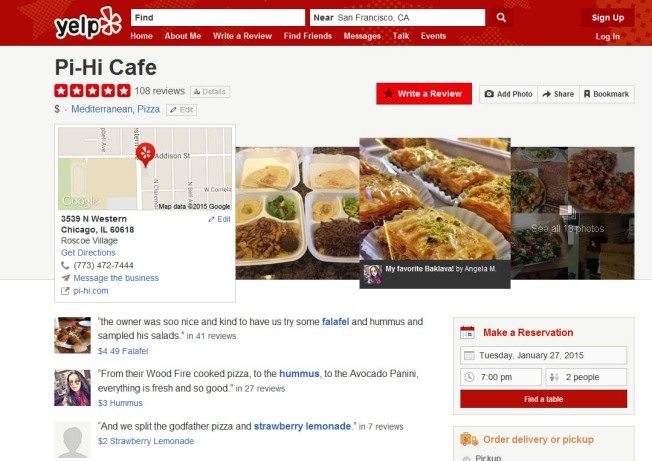 This year Mediterranean joint Pi Hi Cafe is the only Chicago business to be called one of the best in the country by the user-generated site. The Roscoe Village restaurant has earned their five-star rating for their rave-reviewed wood-fired pizzas, falafel and specialties like baklava, garlic hummus and chicken shawarma. As for the top must-try place to eat in the country? You’ll have to head all the way to Big Pine, California to visit Copper Top BBQ. If that's too far, luckily one more Illinois eatery made the list – Elmhurst's Asian fusion sandwich shop Zenwich. “From food trucks to fine dining and even a cafe located in a laundromat, there are hidden gems galore and something for every taste and budget on this list,” Yelp said of the ranking. See the full list of restaurants here.